1 cup self-rising cornmeal, or from a mix, such as Aunt Jemima's. In a medium bowl, mix together the first 7 ingredients (cornmeal through eggs) until well combined. Heat the frying oil or butter in a large skillet over medium heat. Drop about 2 Tablespoons of the batter into the hot skillet. 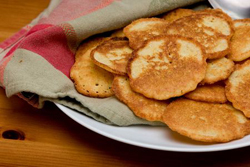 Fry each hoecake until brown and crisp on one side and then turn each of them over to brown the other side. Remove each hoecake and put on a paper towel to drain. Serve while still hot. Hoecakes can be eaten by themselves or drizzled with syrup or crumbled into buttermilk and served as a dessert.